Just a few things that I’ve been carrying around the last week. The sunglasses are a sign of my cockeyed optimism. I’m hoping that if I carry them around for long enough then perhaps the sun will stay out long enough for me to wear them. Happy Monday everyone, as you can see my health kick for summer is officially starting today. I’m swapping my million cups of coffee for green (or herbal) tea, and substituting sweeties for fruit. This is also my last week off before I start the next six weeks of placements at PR companies in Newcastle. I woke myself up early, got some reading done, and started getting through my ‘to do’ list. I was flicking through my notebook the other day and came to my page of resolutions and I noticed that so far I’ve not been too badly. Apart from regular blogging (which has definite room for improvement), I’ve managed to keep up most of them, especially making sure I read regularly. After a conversation with a friend I was thinking about how it would be nice to have some kind of record of what I’ve read so lately I’ve been keeping track of the books I’ve read in 2012 using pinterest. If you’re interested or want to be a little nosey, you can see it here. 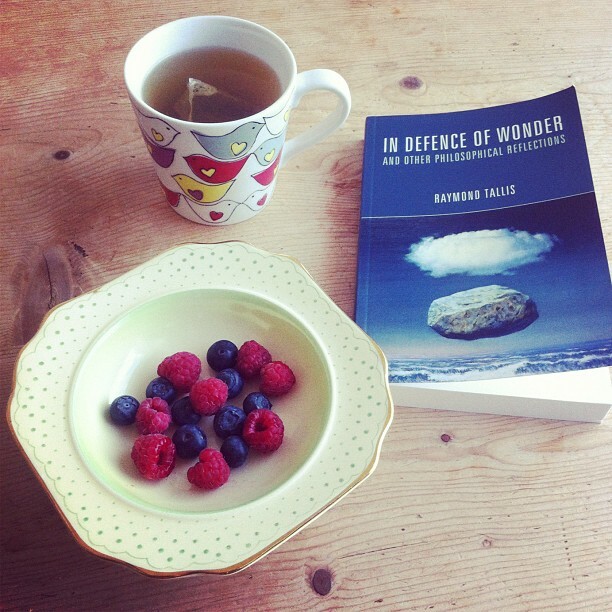 At the minute I’m reading Raymond Tallis’ In Defence of Wonder, because Steven has asked me to write a review for it. It’s a collection of philosophical essay on various topics challenging us to question the things that go unquestioned, encouraging us to see the world in a different way, and to not lose sight of our sense of wonder on the things that surround us. I’ll let you know how I get on with it! Last month, I reviewed Love by Tony Milligan (another book published by Acumen) for The Crack. If you want to, you can read it here (it’s the third one down!). 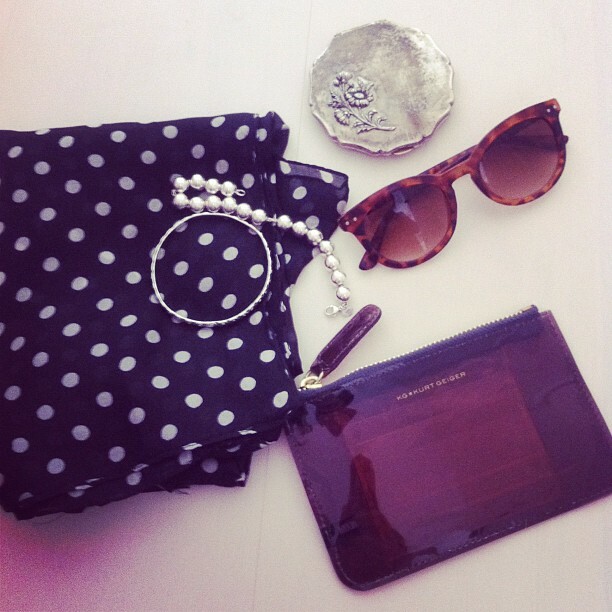 polka dot scarf: from India, bracelet: Tiffany’s, bangle: vintage, compact: vintage Stratton, sunglasses: Primark (last year), purse: Kurt Geiger. I love your KG pouch – I've wanted one like it for ages! I love these pictures, so pretty and your blog is lovely! ahhh, green tea and fruit! I need to start swapping my chocolate treats for that! well there's a few lined up! I'll text you the details cos that's probably easier! love the polka dot silk scarf…. i recently bought a very similar one in paris. i need to wear it before it gets too warm! adore the tea mug! totally adorable! The first picture is amazing,honey! Herbal tea is my favorite. I love love sleepy time teas.